New Delhi: The Minister of State for Minority Affairs (Independent Charge) & Parliamentary Affairs Shri Mukhtar Abbas Naqvi has said that “Hunar Hub” will be established in all the states to provide market-opportunity master artisans belonging to Minority communities to preserve and propagate their heritage. 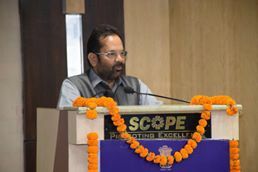 Shri Naqvi said that a “data bank” of artisans/craftsmen from Minority communities is being prepared. Shri Naqvi stated it while addressing the conference of Principal Secretaries/Secretaries-In charge of minority welfare in states/UTs to review progress of implementation of Multi-Sectoral Development Programme, scholarships & other schemes of Minority Affairs Ministry in New Delhi, today. Shri Naqvi said that the Ministry of Minority Affairs has launched a campaign for the development of art/skills of artisans to upgrade them as per modern demands.He said that the states should send proposals to the Ministry of Minority Affairs regarding “Hunar Hub”. The Ministry’s aim is to establish “Hunar Hub” in at least two dozen states where “HunarHaat” and other social-educational and skill development activities will take place. Shri Naqvi further stated that two “HunarHaat” organized by Ministry of Minority Affairs have been hit among the national and international visitors. “HunarHaat” has become an effective medium to provide opportunity to the master artisans to showcase their rich heritage before the people not only from the country but also from foreign nations. The Minister said that during last six months, the Ministry of Minority Affairs also approved more than 200 “SadbhavMandap” and about 24 “Gurukul” type of schools with a cost of about Rs 262 crore. “SadbhavMandaps” will be used as community centres for various cultural-social-educational activities as well as relief centres during a calamity. The Minister further stated that the Budget of Minority Affairs Ministry has significantly been increased after several years. In the Union Budget 2017-18, allocation for Minority Affairs Ministry has been increased to Rs 4195.48 crore for 2017-18. This is Rs 368.23 crore more than 2016-17 Budget of Rs 3827.25 crore with an increase of about 9.6 per cent. More than 70 per cent of this Budget would be utilised for educational empowerment of Minorities and job-oriented programmes for them. A high-level committee has been working on fast track to chalk out a framework of these institutions and the committee will soon submit its report. Central Government is working on a strategy so that these institutes can get started in 2018. The Ministry of Minority Affairs has proposed 40 per cent reservation for girls in these institutions. The purpose of this conference is to review the efficacy of the various schemes of the Ministry implemented during the 12th Five Year Plan and to seek suggestions from the states for their implementation during the remaining period of the 14th Finance Commission (from 2017-18 to 2019-20).